My word of the year, why I picked it and how I will apply it. Plus, some tips on choosing your own WOTY. 2017 is going to be wonderful! The reason I know this is because I have decided it. I am planing away and already checking off to-do’s on week one! YEA-UH! I also have a few secret weapons that are already holding me down such as my planner and my word of the year (WOTY). That’s right. My WOTY is…CONSISTENT. BOOM. I chose an adjective because I want to be DESCRIBE my year not in January so much, but in December, in ONE word. I know it will be many things. I can feel it. I can’t help that. I am a creative. But the left side of my brain wants a challenge. To be able to use one word and feel solid about describing MY YEAR with complete confidence that, that one word. Whoa. Before deciding on my word I thought I’d look it up. You know, for fun. And I nearly second guessed myself on choosing it after reading the definition. I mean, it sounds quite boring. Don’t cha think? I was thinking to myself…well I don’t want 2017 to be boring.. BUT. I quickly shook that notion off. I understand that though some things might be a little boring, the END result will be anything but. What is interesting about being consistent is that the more you do something, the easier it becomes Right? Yes, it does for the most part. However, the challenge comes in being consistent with the hard stuff. So though things GET easier. That does not make them easy overall. Let me give you an example. Food. Oh yes, I said that four-letter-word. Food. I know that meal prepping and eating basically the same or nearly the same genre of food day after day, meal after meal, will become systematic…you know, easy. However, if you are like me and rather take a liking to a variety of foods and outings that involve food and all things yummy carb-filled food, then you might start to feel my point. It ain’t easy. Ouch. Change hurts a little. But, it’s OK. because in the spirit of the New Year and my minor OCD, I think in goals. So when picking my word, I could’t help but associate it with goals. Obviously the food example was not random. Fitness is part of my 2017. It’s part of my life journey and therefore being CONSISTENT in diet and exercise are key to my plan. 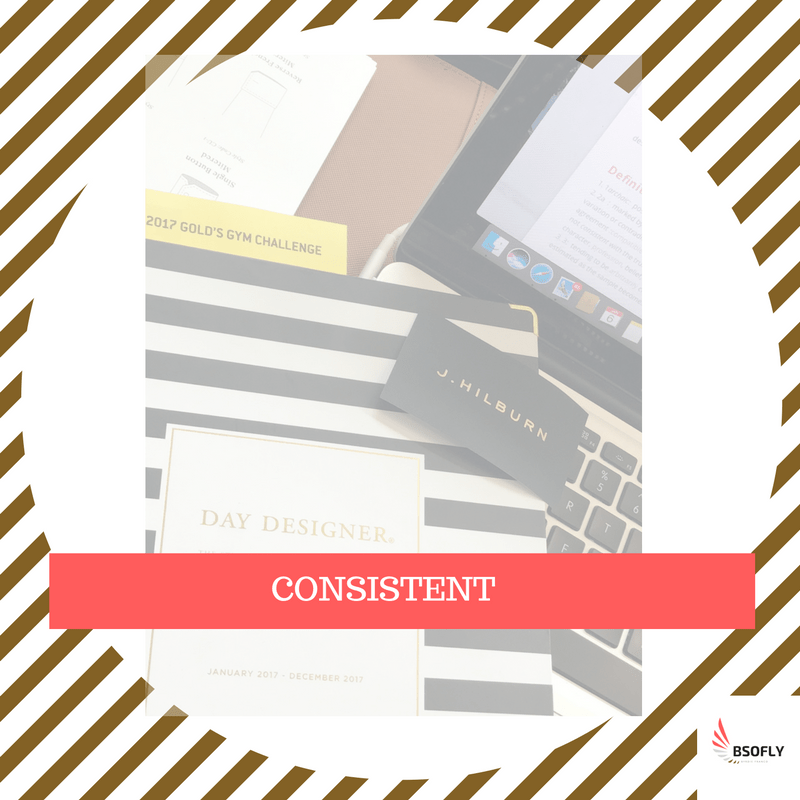 Consistent was the first word that came to my mind when I was thinking what my one word should be. It’s true. And it just made sense to me. There are many ways to decided on what your one word will be and many times I find it to be one of two things: an aspiration or an affirmation. Both are great ways to start thinking about what your word should be. If you ask yourself ‘Do I like what I’m doing and and I satisfied so far?’ and the answer is yes. Then start with an affirmation. Jot down notes of what you are most proud of and things your overcame. Do this freely no matter how small an accomplishment might seem. From that exercise, a word will come to you. It can be any word. It can be a person, place or thing. Now let’s try this. As yourself the same questions as before. If the answer is no, then start with an aspiration. Jot down notes of accomplishments you want now (or yesterday if you’re like me) and also think about some people or organizations you admire. Jot down notes that come up, words that describe those people and things. From this exercise, a word will come to you. Wanna know something else? Both the aspiration and affirmation are kinda the same thing. What do I mean by this madness? Well, take my word for example. Consistent to me is something I aspire to be more of. But if I tell myself everyday that I am consistent, I will make better choices, and at the end of the day, I become consistent. Telling myself that I am consistent is my affirmation that fulfills my aspiration. If this method is not for you, then do something fun on Facebook or ask a buddy for their viewpoint. you might be surprised how inspired you will get for doing so. 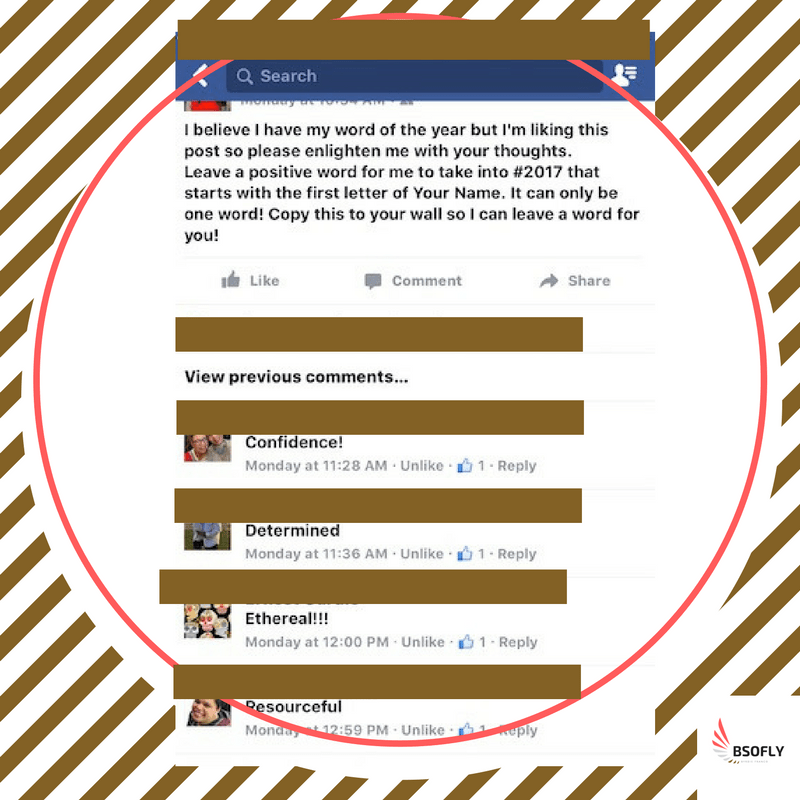 Fun Facebook post to stimulate ideas for your Word of The Year! Over the next weeks, I will go more in depth about my goals through the Be Bold 2017 link-up. To participate in this link up, click the button below to add your word of the year blog post to our link-up so we can cheer each other on! I LOVE that you picked consistent! So much truth behind this word! I have no doubt you will accomplish every single goal you set out! Thank you Christina! So far so good and likewise!